Daisy Griffin, a 14-year-old who has chronic migraine, raised $12,110 for migraine research by sailing alone across the Long Island Sound. She will donate 100% of the money raised to the Migraine Research Foundation. Daisy has had severe migraine attacks since she was four, which have progressed to chronic. Like so many of us, she has tried a slew of treatments, from medications to supplements to yoga to biofeedback. 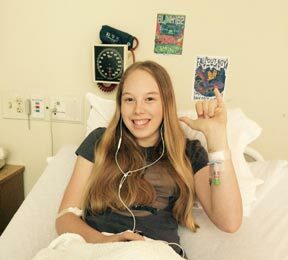 She’s had two in-patient hospital stays to treat migraine. Thanks to a couple preventive medications, she’s feeling better now, but still has a headache every day and migraine attacks at least a few days a week. Daisy sailed an 18-foot spinnaker, the largest boat she’s ever sailed by herself. The sailing itself was much easier than she expected because the wind wasn’t very strong. But little wind also made for, in Daisy’s words, a “loooong” trip. In addition to the sailing trip, Daisy has raised awareness and donations through a booth at local fair (where she hosted a migraine trivia game) and a lemonade stand with her siblings and cousins. She wrote to groups and individuals to solicit donations and publicize her trip. A generous donor agreed to double the amount that she raised, which brought the total to $12,110. You can still donate to Daisy’s campaign and the Migraine Research Foundation through CrowdRise. I’ve never met Daisy, but I’m tearing up as I write about her accomplishments. Much of her young life has been dominated by migraine. Instead of trying to forget about migraine as soon as she felt better (as most of us would have done whether 14 or 57), she threw her newfound energy into raising awareness and funding for research. Her efforts took remarkable dedication and resourcefulness. It’s an impressive feat at any age. Learn more about Daisy and her trip on her website, Sail for Migraine Research. It is by far the most disabling neurological condition. If each of the 36 million people who have migraine donated just $1 each to migraine research, researchers could make enormous strides toward understanding and treating this disabling disorder. Imagine how much we could raise if all the people who love us also donated a $1. It’s not fair that we have to fund migraine research in addition to living with the burden of it, but if we don’t fund the search for a cure, no one will. Please donate what you can to support the 36 Million Migraine campaign. Maybe you do so as a birthday gift to me as a thank you for how The Daily Headache has helped you, maybe it’s in honor of a loved one who triumphs over migraine every day, maybe it’s so your children or nieces and nephews won’t have a life devastated by migraine, maybe it’s for your own sake. Whatever the reason, please donate what you can to help find a cure for migraine. Want to learn more? Visit the 36 Million Migraine website or read this informative brochure (PDF). That’s where the list of facts at the beginning of this post is from. Thank you to everyone who has already donated through Crowdrise!